Liquidfloor is not a concept but a living, moving reality! Consisting of liquid sealed into tiles, when pressure is applied, the floor literally moves and swirls around your feet. Choose from a wide range of colors and color combinations from pastel shades to the brightest reds and yellows. 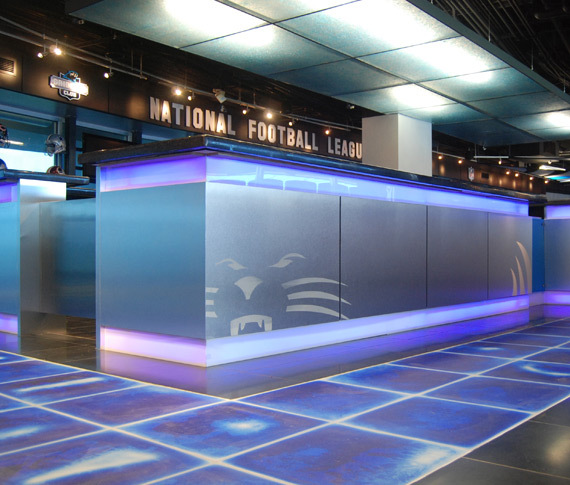 Liquidfloor can be used in nightclubs, restaurants, bathrooms, children’s playrooms, museums and yachts. It can also be used for kitchen counter tops and bar counters. The flexible surface allows with pressure from the touch of your hand or simply placing an object to play with the bubbles on the underlying colors. The imposed pressure alters the intensity of the colors and provokes the continuous transformation of the imagery of the combined forms in continuous evolution. The surfaces are produced in the standard or custom colors. Vivid colors on a white base, like painting with water colors. Multiple shades of the underlying colors appear and disappear on the white background while you interact with the tile surface. The Big Foot Series Tile was create to provide a technical solution to large tiles and non standard shapes. These tiles are particularly appropriate for use in large spaces such as public entrances, play areas, or for special inserts. Unlike the other series the Big Foot tiles are characterized by a 8mm black edge. This tile series contains floating metal elements. The METAL series’ surfaces react to pressure with slow subtle movements, slightly altering the color tone. The touch of a hand or the sole of a shoe can temporarily leave a text or drawings on the tile which slowly fade away. Ideal for play and entertainment. The imposed pressure alters the intensity of the colors and provokes the continuous transformation of the imagery of the combined forms in continuous evolution. The surfaces are produced in two typologies mono-chromatic and bi-chromatic. The Liquid-table is applied on a wood base and can be edged in several different wood finishes. The Liquid-table is fixed to the base with a series of steel buttons. Free line is characterized by it textured surfaced and the colored resin trim with delimits the edge. is applied to a wood base with the possibility of various edge finishes, both wood and metallic. Liquid-table is mounted on a rigid support and finished with an aluminum edge.